CPCS email has been restored. You may also contact offices through the phone. Phone numbers may be found at www.publiccounsel.net/dir. This entry was posted in Information Technology on March 21, 2019 by dsaroff. Our email system is currently not working. If you need to reach a CPCS staff member, please contact them by phone. Our phones numbers are listed here: www.publiccounsel.net/dir. This entry was posted in Information Technology on February 28, 2019 by dsaroff. THE IN COURT APP IS CURRENTLY BEING REDEVELOPED. WE ARE MODIFYING IT TO MAKE IT SIMPLER TO NAVIGATE AND EASIER FOR DIVISIONS TO UPDATE (so we don’t have ‘dead’ links). There is no current ETA for completion. An announcement will be made when it has been redeveloped and all content has been updated. The Committee for Public Counsel Services, is pleased to announce the launch of its first web app, “In Court.” See http://www.publiccounsel.net/incourt. The app acts primarily as an aggregator, collecting links to various resources in a single mobile-friendly location. These are tools attorneys have found helpful to have on-hand in court. A list of most content sources along with an “updated on” date can be found by clicking on the information button (i.e., ) found on each section’s navigation bar. Duty Day Resources. A collection of quick-reference resources commonly helpful to have on hand at arraignment, including: judicial assignments, access to the MA Master Crime List and DYS grid, a tool for calculating indigency, and links directly to statutes for bail, dangerousness et al. Practice Guides. A collection of guides and case notes for adult and juvenile criminal practice, child and family law, and mental health litigation. Statutes, Cases, Rules et al. Links to commonly referenced rules and statutes along with tools for searching statutes and case law. Tools and Guesstimators. A collection of general tools that might prove helpful, including a duration calculator, historical weather data search, language translator, and sentencing calculator. Tables, Lists & Glossaries. Includes: a list of judicial assignments, MA Master Crime List and DYS grid, and commonly used disposition codes to name a few. Directories. Includes: attorney lookup by BBO number, court directories, CPCS staff directory, Mass Legal Services resource finder, District Attorney offices, DOC facilities, social service organizations, and DMH offices. Legal App roundup. 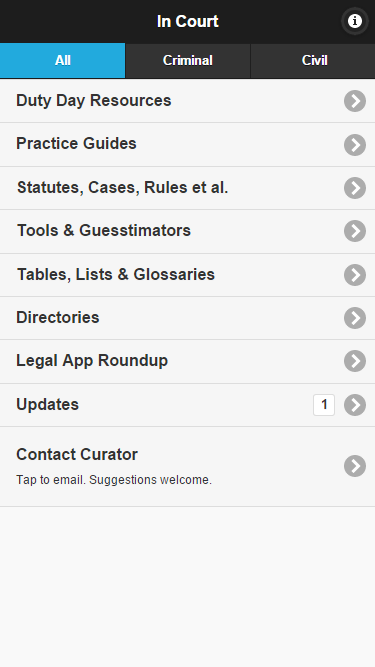 A list of legal-interest iOS and Android apps. In Court is a web app. So you will not find it in an app store. All you have to do is visit the In Court page and add it to your home screen. If you’re unsure how to do that, check out How to Add Websites to the Home Screen on Any Smartphone or Tablet. For those of you interested in the details, the codebase for the app is available on GitHub and licensed under an MIT license. This entry was posted in Information Technology on April 23, 2015 by admin.